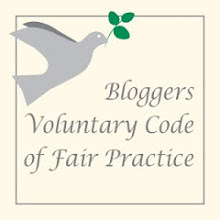 I am in the process of trying to clear out my freezer and dig out some things that have been in there a while and need to be cooked, you know what I mean, things that get pushed to the back, drop into cracks or you just can't be bothered to cook because of the preparation involved. 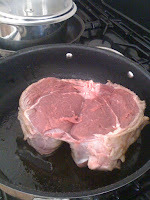 This weekend out came a lump of beef with the label Beef Bolar Blade Roast. To be honest I wasn't entirely sure what that was. The man turned his nose up and said "sounds like cheap stewing steak to me". I still hesitated - the word "Roast" threw me, but not wanting to roast it and it be tough and get the "I told you so" looks, I thought maybe a pot roast might do the trick. 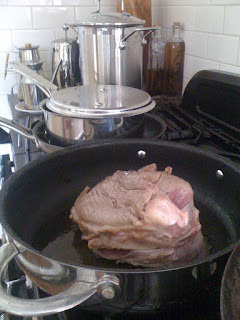 I looked through a few of my books before Beef Pot Roast Provencal took my fancy (sounds much better than Bolar Blade!) in Leanne Kitchen's book "The Butcher"! (It always makes me smile when people's names are synonymous with their profession). So, a quick scan of the ingredients confirmed I had everything (if not exactly - I could improvise) and as this was going to take at least two hours to cook I needed to get my skates on (and the air-conditioner). The meat had defrosted the night before so I was good to go. Heat olive oil in a deep heavy-based saucepan or pan. 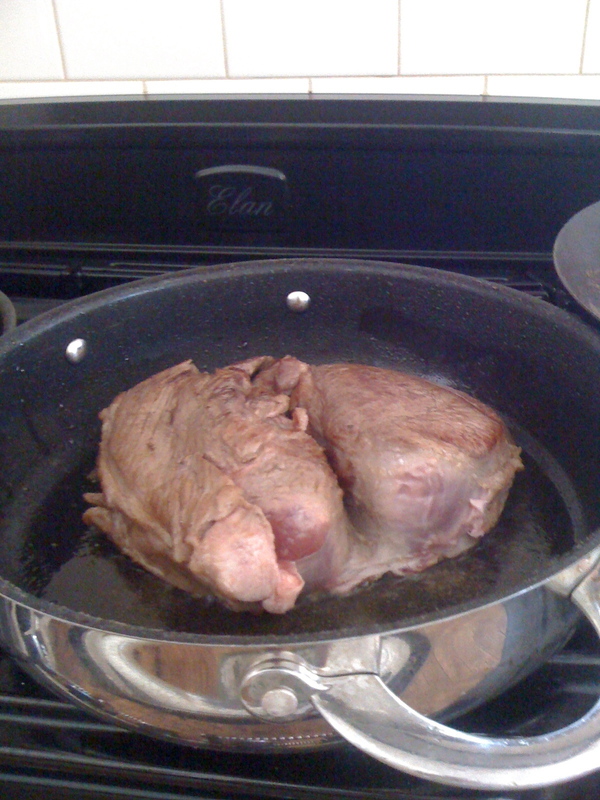 Add the beef and cook over med-high heat turning to brown all over. It was obvious my pan was not going to be deep enough to take my lump of meat so I buterflied it down the middle to open it up enabling it to lay flat in my pan. 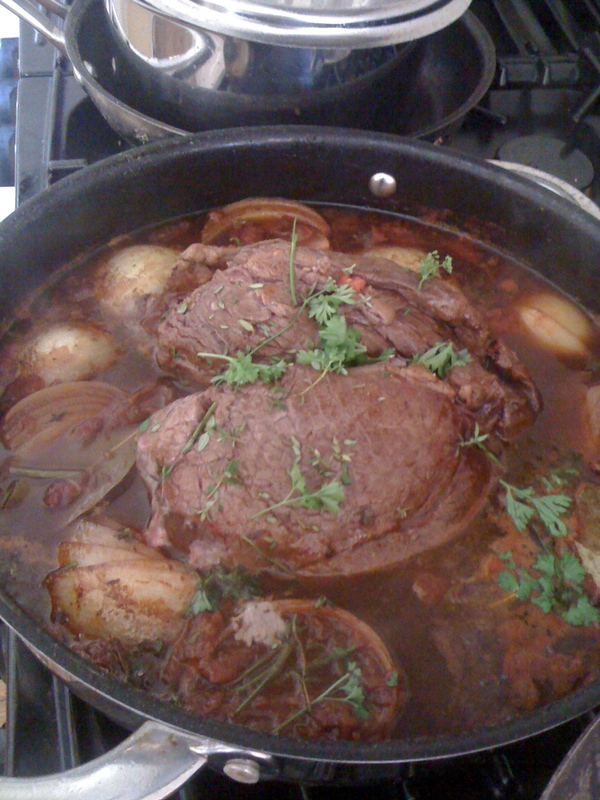 When sealed on all sides add tomatoes, stock, wine, rum/brandy, onion, garlic, bay leaves, parsley and thyme. Cook over low heat for 1 1/2 hours. Add carrots and cook for a further 30 mins. 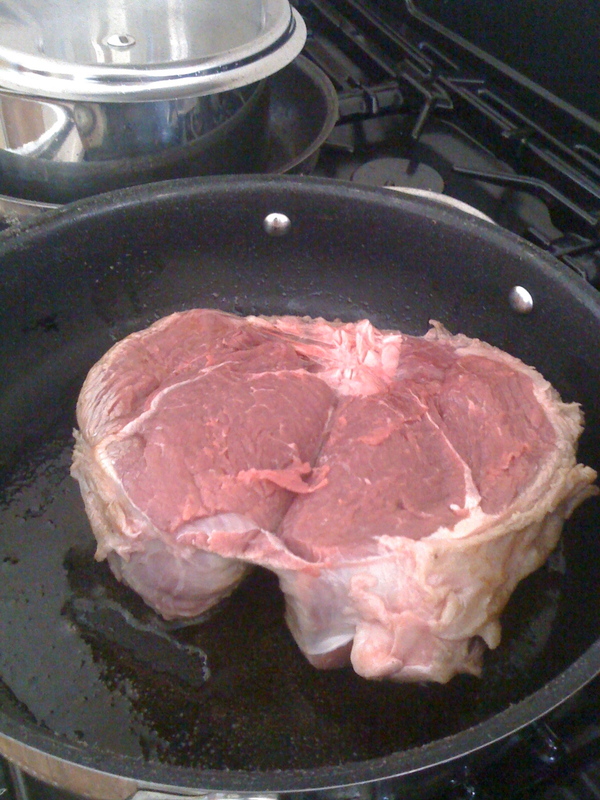 Remove beef to a plate and cover with foil to rest for 10 mins. Put flour in a small bowl and stir in enough water to make a smooth paste. Add the paste to the pan - stirring constantly over medium heat until it thickens - then cook for 3 mins. The beef is then ready to carve although mine was so tender it practically fell apart and drizzled with the gravy it was yummy. The real reason for wanting to make a roast was my $2.50 charity shop find on Friday! I dropped in a bag of unwanted stuff and had a quick look at the china and glasswear. 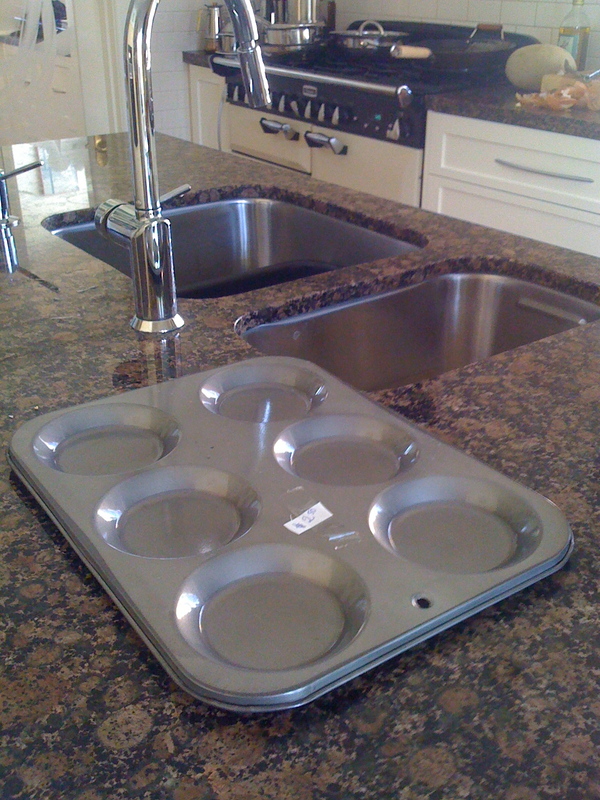 I have had an eye out for a yorkshire pudding tin as mine had gone astray years ago (or poached by daughters) and have found them very difficult to find so I was quite excited when I saw this practically new tin and I just had to buy it. So while the beef was cooking I mixed up the flour, milk and egg batter for the puds. Greased the tray with lard and put it into the oven on high until the tray was smoking. pour into hot pudding tray, bake till brown and crisp. Poured in the batter and cooked for 20mins. After 10 mins the tops were looking browner than I would have liked so I flipped them over - hence they look more like buns than highly risen puddings. This did not distract from the taste I can assure you and we managed to eat all 6 between the two of us!! The house smelt unbelievably good, the man was satisfied, what more could I ask for! Interesting name, I have never heard of a bolar blade cut here. Either way it came out lovely and would be something my guys would enjoy. Yes I agree - not a very inspiring one either! But it certainly turned out lovely. You should google the name and find out what it is - second thoughts, I think I'll do that, it's intriguing. Dinner sounds mouth-wateringly good though. Jennifer took your advice and google searched (don't know why I didn't do that first) and surprisingly was not too far from the mark. Google said - The bolar blade comes from the shoulder and is the ideal cut for a beef pot roast. It is an inexpensive cut which is easily carved. A rolled and tied beef brisket is also suitable. Anne - me too. As half of the meat was left over I wrapped it in foil and put it in the fridge. It carved perfectly for sandwiches the next day. I love how you made good use of something that you'd bought and you didn't let it go to waste. Your dish looks very tasty and I'm sure with the long cooking time, that bolar beef became as tender as eye fillet. And what a great find! 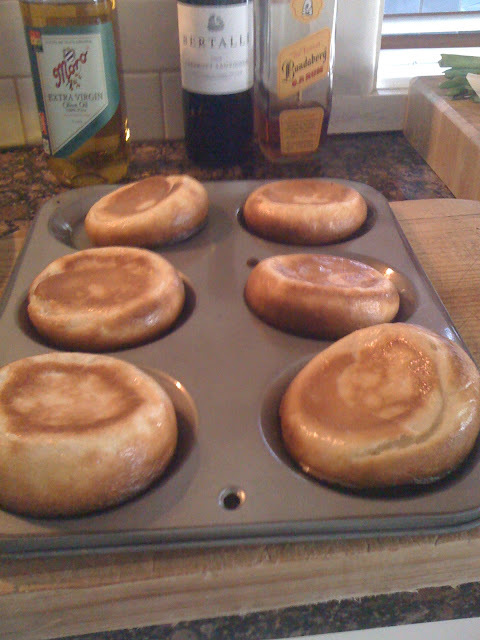 Is there any better combination than beef with yorkshire puddings! Great post Magnolia! Charlie - I hate waste - must have been my upbringing being a post war child! Hello - thanks so much for this recipe - it totally saved my day. I picked up a roast at the market and didn't even realise what it was until I got home. My partner was expecting a more traditional Sunday roast but, as luck would have it, after Googling 'bolar roast recipes' I had all the ingredients for this one so just pretended that I'd decided to mix things up by doing a pot roast instead! It was delicious and went down a treat with the other half. Thanks again! Oh my goodness so glad you found this recipe. And so nice of you to comment. Hope you come by again! Classic Salad Dressing - simply PERFECT! Strawberry and Passionfruit Jam... not yet!